Perhaps I could wax poetic about panel lines, the convention crowds, the cosplay, the marketplace, the gaming room, the indie gaming showcase, etc. But that all ought to be set aside until attending the convention proper. Only then would it be good to pick back up on that train of thought. Since then, Friday, June 23 to Sunday, June 25 has passed, with each day spent roaming the halls of the Greater Philadelphia Expo Center. TooManyGames 2017 was, in short, a fantastic time, a whole lot of fun. However, thinking back on those experiences from just a short while ago, something in particular sticks out to me: I learned more from the various panels and events than I’d have expected. Which turns out to be the key for how to best convey what it meant to be an attendee at this humble convention. How about recounting what I found out about video games this weekend? Thus, here is an unranked series of seven things that I learned which stuck out to me the most. This was the first convention I attended after writing this long spiel of predictions about the Nintendo Switch. Thus, honor compels me to revisit the issue and reflect: How on the mark was I? First off, there were still far more 3DSes to be found, but there were indeed several Switches out in the wild. Considering that the system has only been out a little less than four months, whereas the 3DS has more than a half decade to its name, that does not strike me as such a bad showing! I imagine it will build up a stronger presence the longer the system is out, when a larger library kicks in and also, quite frankly, when more people have the ability to get their hands on these things. Thus, the jury is still out on this one—being too early to fully evaluate—but I am optimistic. Other things I saw that I did predict? Single-player gaming, with some Legend of Zelda: Breath of the Wild going on. Wireless local multiplayer across multiple Switches, courtesy of the recently-released Arms. And oh yes, the Switch is easily the most portable console there is, indeed trouncing the Wii U, particularly when something like the deluxe carrying case is in play. Things that I did not see, and thus may be bunk predictions? The kickstand; with the sole exception of me, because everyone else played in handheld mode. By extension, there was also no same-screen multiplayer. Handheld is shaping up to be the prime way to play the Switch at a convention. Gaijin Goombah, a YouTuber who is additionally part of The Game Theorists, specializes in dissecting the mythology and cultural cues and artifacts that are prevalent in video games. Japan is a particularly strong focal point for him; he’s even lived there for a period of time. Thus, it sure seems like such an obvious conclusion that he must be big on the well-acclaimed Persona series, thoroughly steeped in its Japanese-ness as it is. Going to his Q&A panel Saturday afternoon, I found out it’s actually quite on the contrary. Gaijin Goombah is no Persona fan. Why that is the case comes from his time in Japan. Starting out, he went to the country working as a high school English teacher. And boy oh boy, his experiences went so so well, he never wanted anything to do with Japanese high school ever since. That aversion extends to video games as well. Hence Persona—revolving as heavily around the scholastic day-to-day as it does—being perhaps slightly unappealing to him. One of the panels I went to was “Inti Creates - Experiences with the Nintendo Switch,” led by the CEO of the Japanese game studio, Takuya Aizu. It was a slightly misleading title and description—“Learn about how games are made and sold on this new hardware!”—mostly being a sizzle reel showcase of Inti Create’s repertoire over the years in reality, but Aizu did share some interesting anecdotes. Perhaps the best one had to do with how their Switch and 3DS title Blaster Master Zero came about. E3 2016. With a whole day’s worth of interviews and events canceled, Aizu was instead spending his time roaming the show floor. At some point, he met a representative from Sunsoft, who related to Aizu that he was aiming to meet with Nintendo in the hopes of pitching a Blaster Master revival. However, there was a major problem. The rep did not have the credentials needed to make his way to Nintendo’s area. But Aizu did, and with nothing else to do anyway, he offered to reach out to Nintendo himself and arrange a meeting. His efforts were successful, and thus a Nintendo representative, the rep from Sunsoft, and Aizu went to a nearby cafe to discuss the Blaster Master pitch, Aizu being in tow solely because he brought the whole thing together. The talks evidently must not have been going so well between Nintendo and Sunsoft; Aizu’s way of describing the state of affairs during his recounting of the event (as translated to us) was that the atmosphere was “heavy” and “tense.” Seeking to break the tension a little, he decided to throw in a little joke. Hey!! What if Inti Creates developed this Blaster Master remake? Eh? Eh?? The Sunsoft and Nintendo reps took it seriously. And that’s why Blaster Master Zero exists. My girlfriend and I had never heard of The Game Chasers before. That did not stop us from being interested enough to sit in on their Q&A panel on Sunday. We left shortly after. It was an off-putting experience for us; they seemed like dicks, and we weren’t interested in sitting through a whole hour of that, plus we were hungry anyway. Later on, though, something weird happened. Not even a day after the end of the convention, we decided to check out a bit of their show on YouTube. It then promptly became the most-watched thing of the past week for us. Turns out, The Game Chasers is good! They mentioned during their Q&A that they were explicitly angling for the American Pickers of video games, and this basically nails it. It’s a reality show-type recounting of the gang’s adventures in retro game collecting, complete with interviews, and the end result is some rather chill and often funny times. It also helped put a lot of the personality and brand of humor that we saw at the Q&A into perspective. I am happy to say that I’ve ended this week feeling infinitely more alright about The Game Chasers than at the beginning. An example of how giving a second chance is indeed sometimes worthwhile. 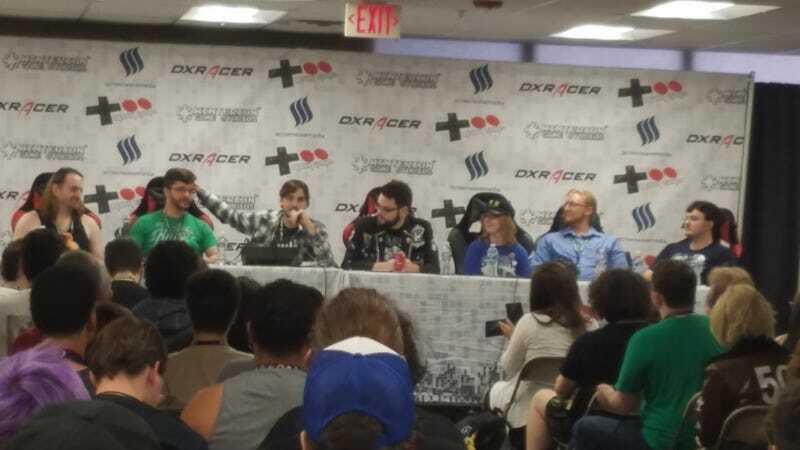 This was a tidbit from one of best, most interesting, and most informative TooManyGames 2017 panels I attended, “Retro Collecting 101.” It was an eye-opening view into a hobby and passion with which I am not well-acquainted. It also did a lot to explain why TooManyGames—both this year and last—seems far more oriented towards the older era of gaming instead of what is going on with modern gaming; the dealer’s room, chock full of shops for older games and hardware, is consistently a goldmine for anyone in the hobby! There is an extensive bullet-point list to be made of everything I learned and what advice was given—some of which likely wouldn’t be news to anyone well-versed in retro game collecting; do keep in mind that I’m a total newbie—but one tidbit particularly stuck out. It is understandable that not all forms of video games may not get equal love from collectors, but there is one kind of game that that gets treated with outright contempt. It came in the form of advice delivered as an audience question. What is one thing that you should never pay for in retro collecting? All at once, the audience responded as a chorus: Sports games. It’s hard to overstate the brutality; the panelists and audience alike were not kind, and it was kind of hilarious to witness. Derisive laughing for practically half a minute! Quipping about how merchants should be paying you for taking these games off their hands! Coaster jokes galore!! As if to specifically put a fine point on this attitude in retro collecting, there was even a moment in The Game Chasers, watched post-convention, where one of the guys was compelled to straight-up justify his interest in a sports game. On one hand, I can totally understand the attitude. It may very well be the least rare type of game possible, especially given how most sports game franchises have been on annual release schedules stretching back decades, and perhaps it may be the least “interesting” type of game where they are concerned. One the other hand, though...maybe this is a whole can of worms for an entirely separate discussion, and also the result of following the work of notable sports game buffs like Kotaku alum Owen Good, but this sentiment also somewhat perplexes me. Regardless, it is the sort of insight that I would have never assumed before this year’s TooManyGames. Tying into the last point about retro collecting—and certainly influenced at least somewhat by attending that panel—one of our last-minute convention goals was to pick up a copy of Puyo Pop Fever for the Nintendo DS. My girlfriend already had a copy of her own, but we wanted to get a second one so that we could do some proper multiplayer together, since the Download Play feature was simply not cutting it for us. Thus, we trawled the dealer’s room in search of the game. It took a little while, but eventually, I spotted it at one of the sellers, complete with the box and the manuals, in pristine condition! The cost to purchase was $32 USD, i.e. it didn’t quite come cheap. Yet it may very well have been the best deal that us neophytes to retro collecting would have found. One of the other pointers from that panel was that online sellers like Amazon and eBay—the avenues we would have otherwise explored before last weekend—are some of the least ideal places to get retro games from. Looking up the going prices and available options for Puyo Pop Fever afterward basically bore that out; see here and here. For a game purchase that was basically the complete package, box and manuals included, what we got at TooManyGames trounces what we would have found online. As for whether we got it for a genuine steal within the bounds of serious retro collecting? Maybe not so much. Looking up the game on the Price Charting website, the current going rate for a “complete” package is apparently $25.95 USD, while the going rate for a wholly new game is $39.99 USD. As our copy was most likely used, considering the lack of shrink wrapping, that would mean we overpaid by six bucks. However, the enjoyment we’re going to get from it is bound to trounce any trace of regret we’d possibly feel from such a thing. My girlfriend and I don’t usually go to any of the various concerts put on at TooManyGames, either last year or this year. However, late Saturday night without anything to do before a panel by MrCreepyPasta, we decided to hang out at the concert hall. The band about to play was Powerglove: a name that I had heard of lots over the years, but had never actually taken the time to listen to. Thus, neither of us really knew what to expect. They then promptly opened their set with a metal cover of the Tetris themes. The whole concert was incredible. And to think that we went without this excellence for so many years!! Did any of you go to the convention as well? I’d love to see your thoughts and experiences if so. Otherwise, I implore you to share the most enlightening thing you found while at a convention.